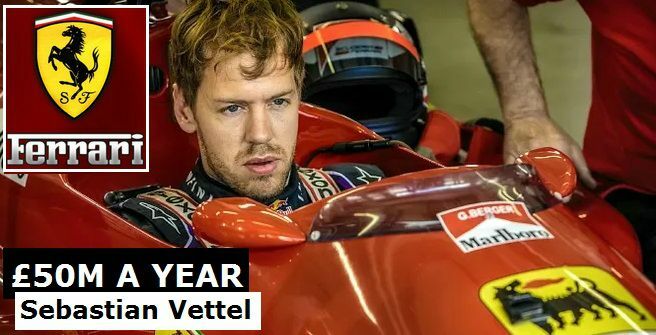 Germany Formula One driver Sebastian Vettel who won four back to back F1 championships from 2010 to 2013 has signed the most high profile contract with F1 giants Ferrari to be their main driver starting from 2015 season. Update: Unlike the earlier reports of $50m a year salary, we can reveal that Vettel signed a tier based deal with Ferrari where he will earn $50 (£33.7m) million guaranteed in first year and $30m (£20.4m) a year afterwards with max bonuses of around $10 million (£7m). Here are the basic details of Vettels new contract with the team while further down the page you can find other top 5 highest paid drivers in F1. Vettel’s arrival at Ferrari is signaled the end of spanish driver Fernando Alonso with the team, Alonso signed a 3 year deal with McLaren Honda which is worth $40 million a year depending on performance related bonuses. although Alonso had one year left on the Ferrari contract but Sergio Marchionne, the new president of Ferrari lured Vettel to the deal and they agreed terms personally (Vettel dont have any agent or manager, he manage his professional contracts by himself). However Formula 1 CEO Ecclestone played a big role in not only advising Vettel for the move but helping him to sign one of the most lucrative deals in history of sport. Before Vettels contract it was Fernando Alonso who topped the salary charts in Formula 1 ‘for last 5 years. Lewis Hamilton won the 2014 F1 championship and he is likely to sign a new three year deal with Mercedez which will keep him at the helm till 2017. His is likely get the same basic salary of £20.9 million ($31m) a year with new Mercedes deal but with massive bonuses for winning grand prix races and F1 World title, bonuses could take his yearly salary to £29.9 million ($42m) a year. So Vettel, Alonso and Hamilton are the top three highest formula 1 drivers in 2015 season. Here is the list of Top 5 highest paid Formula 1 drivers going into the 2015 season. The guy who wrote the article need to lear math. Alonso earns more than Vettel.